Today, in a taxi to the airport, I heard the worst advertisement ever. RBTT Bank’s newest promotion involves the following promise – spend over US$1000 before Dec 31st, and be automatically entered to win a chance to have the entire balance paid off in January. In short, the bank is encouraging its customers to make over a thousand dollars in new purchases, in order to qualify to win the promotion. It just all seems to be encouraging gambling – paying cash in order to have a random chance of winning big. For some reason, I doubt that RBTT has imagined the full range of outcomes. Let us, on their behalf, perform a thought experiment and imagine what would happen if the promotion is wildly successful. One person “wins” and ends up with a nice zero balance. Hundreds or perhaps thousands of customers end up with new balances over US$1000. Many of them might well have changed their buying pattern or choices in order to win the promotion. Some will have used credit instead of cash. Others will have decided to make purchases they never intended to make in order to qualify. All will have new balances of more than US$ 1000 on their RBTT card on Dec 31, and the majority would have them because of the “success” of the new promotion. RBTT would seem to be a winner, if the promotion succeeds. After all, new balances mean new interest income. But does RBTT really benefit in the long-term? 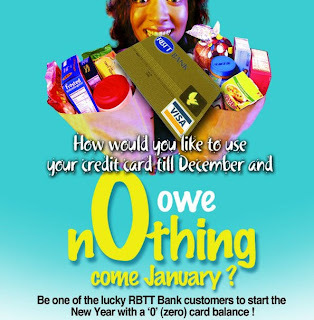 I cannot imagine that the kind of customer who would change their buying habits in order to take on new card debt to win a lottery is the kind that RBTT wants. After all, a gamble on that filly in the 5th is not the same as a gamble on a new US$2000 card balance. When the 5th race is over, the transaction between the track and the bettor is over. However, on January 1st, RBTT will have a new long-term relationship with a debtor who is essentially a gambler. I cannot imagine that this fits the profile of the ideal customer. If I were RBTT, I would immediately “assist” these new debtors to break their addictive habits. Maybe Gambler’s Anonymous? After all, surely RBTT does not want their customer to repeat the behaviour. If the program is successful, and other banks decide to play copycat, I am sure that RBTT does not want them jumping ship in time to gamble once again. Instead, RBTT must want the gambling card-holder to settle down, see the error of their ways, and become a faithful and trusted customer who pays the monthly bill like clockwork. 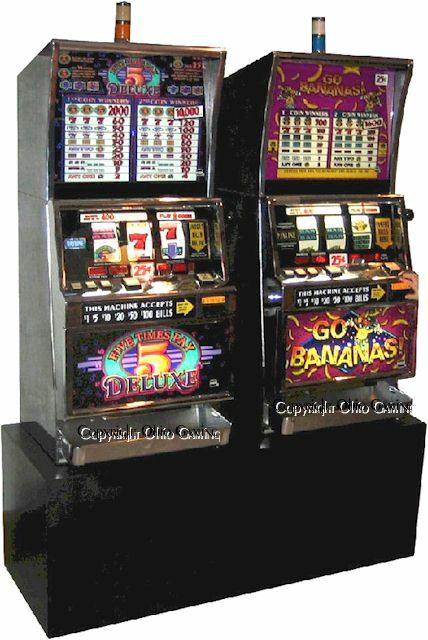 All this, rather than chasing down the next card, dice, scratch, domino or internet game of chance. Hopefully, when this unlikely “transformation” occurs, they will bear no resentment towards the bank for profiting from their weakness for the thrill of a win. P.S. I received the following email at left in my inbox on 12/22. This past week I attended small parts of the Human Resource Management Association of Barbados’ annual conference in Bridgetown. I had an opportunity to reflect on how lucky I am to be a Caribbean professional — one who travels and works across a region that I am proud to be a part of. This contrasts with the time spent living in the U.S.A. when I could never shake the feeling of being a stranger in a country I was unable to care deeply about. I am thankful to be home, and I consider each territory in our region to be a part of my extended home, and each business to be one that is an economic extension of my own. In this sense, my comments on BWIA in this issue are spoken as an extended owner,and while the airline’s seemingly rough landings make me very nervous each time around, I think of them as our landings, by our airline, owned by our people. I flew BWIA West Indies Airways last week and had some time to think about its upcoming demise. BWIA, the official carrier of Trinidad and Tobago, is officially going out of business on Dec. 31, 2006. It will be replaced by Caribbean Airlines, which apparently will take over much of the equipment, personnel and routes of today’s BWIA. At the same time, there have been announcements in the press about the possibility of an upcoming merger between the airlines of LIAT and Caribbean Star. The coincidence is that both of these activities are taking place in the same industry, at the same time. As a past customer of all three companies, I read the pronouncements in the press while thinking that not much would change. As I sat in my seat on a recent BWIA flight wondering where my lack of confidence was coming from, I happened to lower the tray-table and registered a familiar sense of annoyance with a “steupps” of the teeth. 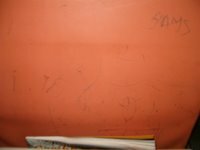 As usual, the back of the pink, leatherette seat in coach class was defaced with graffiti and pen marks. A pet peeve of mine is that somewhere, someplace, someone decided to pick these particular seats. The problem with them is not that they are ugly, but that they are perfect for writing on. 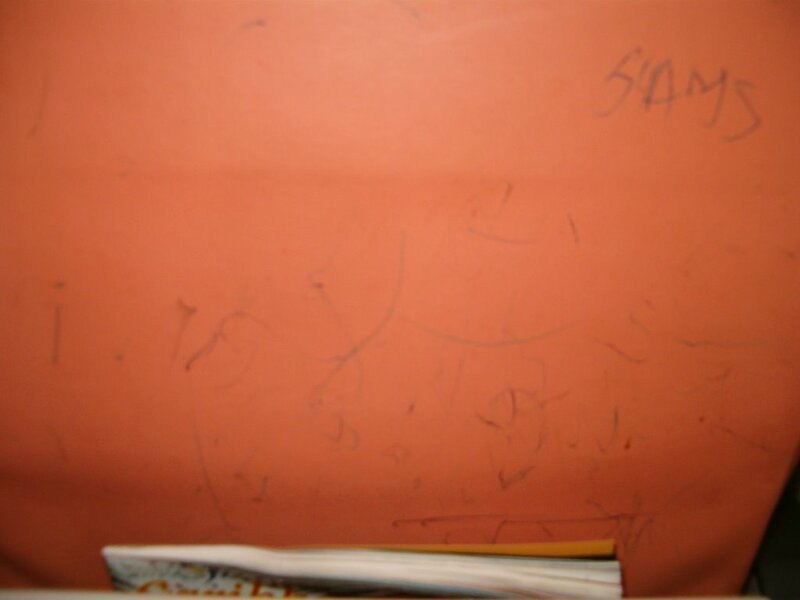 The result is graffiti… hidden behind the tray-table, on the back of every seat. seats could not be reliably cleaned? Why couldn’t someone install some kind of cover? be repeated in the new Caribbean Airlines? whatever organizational culture allowed messy seats to be the norm, is likely to be continued in the new company. After all, the CEO will be the same, and the vast majority of the new airline’s staff will be drawn from BWIA. I asked myself, if I had a blue-print for creating the new airline, what would it look like? I came up with three simple, but uncommon steps that I think would apply to Caribbean Airlines as well as to the possible LIAT/Caribbean Star merger. The airlines should focus on embracing, rather than denying, their history of failure, co-creating the future with their employees and making bold requests for action and sacrifice. 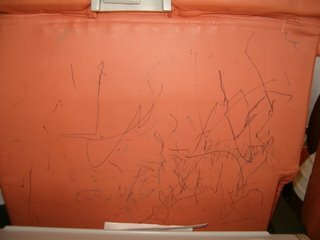 new airline is to inherit the fine safety record of the soon to be defunct airline. Unfortunately, any kind of transformation program gets its strongest start from doing the exact opposite. Instead of ignoring the past, the first step to a deep transformation is to embrace the historical reality fully and completely. One way to do this would be to engage all the employees in an exercise to bring closure to the company’s past. This exercise would have to encompass both the positive and negative aspects of the company’s performance to date. The truth is, in spite of best efforts, BWIA was a financial failure. At the same time, many good things happened for the thousands that were employed and their families in its sixty-plus year history. In Step 1, this mix of positive and negative results would have an opportunity to be fully aired and expressed. Practically, this could be done in BWIA in a series of meetings, primarily devoted to exploring the past in order to tell the truth about it. There would be no effort to try to change anything at this point. Instead, the positive end-result would be that people’s aspirations and hopes would have a chance of being put to bed, and their disappointments would have an opportunity of being addressed. For the typical results-driven, Type A executive, especially, this can all be very difficult medicine to swallow. “Embracing the history of failure” looks an awful lot to them like slowing things down, and avoiding the job that needs to be done. They might well argue that people should be able to move on, and just forget about the history. Or they might say that such an exercise should be delayed until the new company is launched. However, it is quite normal for a CEO to be able to mentally and psychologically make a shift that their staff cannot. The staff of the new airline will have 550 employees, compared with the 1800 that BWIA had. The vast majority of them will come from the old company. The fact that they would have been selected, and their colleagues left without jobs, provide perfect conditions for survivor guilt, the debilitating emotion that affects employees in situations like this. Research has shown that employees experiencing this phenomenon can experience productivity decreases by as much as 50% for months at a time. Doing the exercise inside BWIA, rather than Caribbean Airlines, could leave everyone satisfied that they have done their best to take care of all their colleagues, while preparing all the ex-BWIA employees for whatever is next in their careers — Caribbean Airlines or not. I imagine that the transition team is currently focusing on the “hard” aspects of the business — those that are measurable and tangible. If executives could stop the frenetic 24/7 activity that is no doubt underway, it would help build a strong foundation for the new airline to build on. From my work with regional executives who have lead such transitions, their message is a singular one: the “soft” aspects of your transition are more important than you think. Once employees experience closure, it takes only a nano-second before they feel the creative impulse to create anew. A smart company will capitalize on this energy and meet this impulse with an opportunity to co-create. From my experience, it does not matter what exactly gets created, whether it be a statement of values, vision, strategy, a business plan or even a new company logo. The actual creative activity is irrelevant. It is equally important that everyone has a chance to be heard, to contribute, and to see how their contribution might be included in the final result. I have seen very few companies in the region put themselves through this process, and do it well. I put this down to a paucity of methods, and an unwillingness to risk the activity going badly on a public scale, rather than a lack of awareness of the need. This might be the hardest step of all. CEOs and Managing Directors in our region have come to believe that a key part of their job is to shield their employees from bad news. This paternalistic relationship is one that is actively encouraged or passively allowed by both employees and managers. However, paternalism is the very opposite of the responsible, adult-like give and take that marks healthy companies. Without this kind of relationship, it is impossible for companies like BWIA to make the changes it needs to make. Obviously, if Caribbean Airlines conducts “business as usual,” it will result in more of the same failures. about. When the requests made of employees are bold, and big, it can help to demonstrate that the days of paternalism are over, and that progress will only come from cooperation. In fact, it is widely believed that BWIA’s demise had more to do with a lack of cooperation than anything else. The inability of the management and unions to work together to save the company was seen by the owners as the final straw. This third step is not optional. If it is taken, managers can make the case that the unusual circumstances involved, require everyone to find ways to change the way they do business. In the case of Caribbean Airlines, a critical mass of employees doing business in new ways is the only thing that will make a difference. 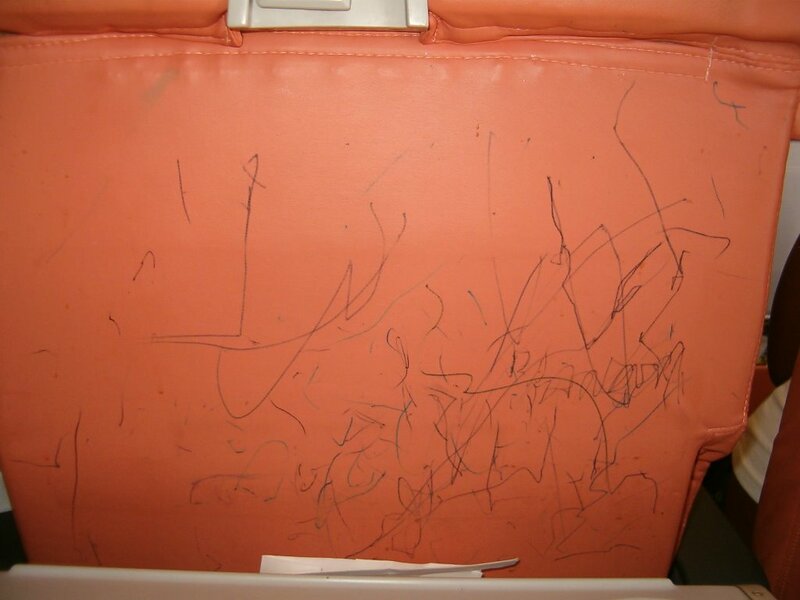 What will prevent dirty seats is not just new fabric. Instead, it will take a concentration of human energy to overcome this, and other hard-to-solve organizational problems. Ultimately, BWIA could not solve the problem of either clean seats or job-saving profits. Starting off on the right foot might save Caribbean Airlines, and Caribbean Start/LIAT, from continuing the sad legacies of the past. A white paper called “Equal Shmequal. It’s Never a Merger of Equals” written by a former employee, Amie Devero, can be found among our white papers at www.downloads.fwconsulting.com. This short but brilliant article applies to every merger I have ever witnessed. Framework’s One-Page Digest will be launched by the next issue. The Digest is intended as a short email with clickable links to some crucial resouces for Caribbean Executives, produced on a monthly basis. Current Research Update: Study of Trinidadian Executives Working in Jamaica. 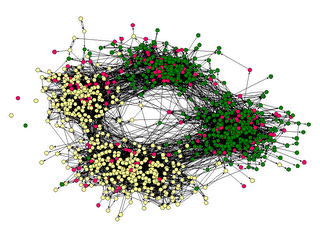 We have begun to analyze the data collected, and are falling in love with what we are finding. An idea has come up that we should be looking to a second phase in which we include expatriates from other countries. A couple of days ago I met a friend, colleague and business partner of mine who lives in Trinidad. We spent all of an hour together. Yet, this was only the second time we have ever met in person. The Internet has further opened up the possibility of doing business with people that we hardly know, and this is not limited to performing simple transactions. What enables this deeper level of commerce and cooperation is not how well we know other people from first-hand or second-hand sources, but how well we can get to know them from the different sources that exist in cyberspace. Knowing someone from their Internet “reputation” is very different than knowing that they have certain qualifications or experiences, or hold one position or another. I am listening to a brilliant, not-so-new audiobook by Seth Godin called “All Marketers are Liars.” In the book he talks about a company being authentic, and allowing its true character to come across in all communication with the public. 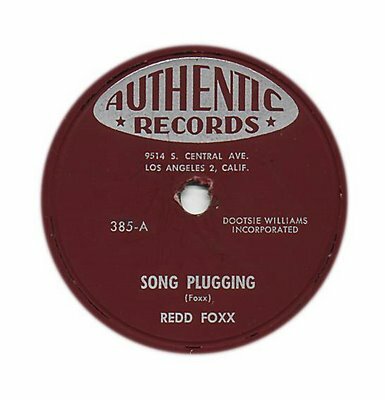 An example: some CEO’s have blogs, and these blogs give very powerful insight into the true nature of the company, especially when the blog has an authentic voice. Not surprisingly, those bloggers that insist on trying to “put their best face forward,” are the ones that appear to be the most “faked”. When the blogger is a CEO it puts the entire company at even greater risk. Successful networking in the Internet age has a great deal to do with having the courage to be authentic in cyberspace, and taking a lead in defining oneself. The truth is, that if we do not take the lead to do it ourselves, then someone else will do it for us by mentioning that they met or know us, and what their impressions are/were. In other words, we run the risk of being defined by others to our detriment. Most of the defining will be done by strangers. Can these strangers be trusted? Whether or not they can be, they must be interacted with, if we as professionals are at all interested in creating a personal brand that people can trust. If we think about the interactions we are interested in having, we can drive them towards certain outcomes that we have an interest in. For example, a professional project manager who has an interest in the management of concerts could express it in the formation of a public brand that demonstrates their passion, and expertise. Over time, they could simply corner the market on this brand by generating an Internet and therefore public presence. What allows this to happen is a skill at interacting with strangers in cyberspace. This is a skill that I cannot quite name, but it has to do with learning how to make and trust Internet acquaintances, both professional and personal. Kids in their teens get this concept readily — they live in a networked world in which friends are thousands of miles away in other countries, and they communicate with them via IM, email and text messages in real time. In our day we had something called a Pen Pal — a stranger we got to know by exchanging mail over long distances, and long time periods. Today, the intervals have been shrunk dramatically. We have blogs like this one, in which, with the click of a Publish button, anyone in the world can have instant access to any of the thoughts that I wish to share. The difference is staggering, and the trust required to operate in this new world is quite different from what it ever used to be. Instead of trusting my Pen Pal, I now need to trust millions of people who interact in cyberspace. The upside of all this instant exposure is that cyberspace can be used to amplify authentic messages — warts and all. For the professional, deciding to stay away from it all is just not an option. Having no presence on the Internet is a little like not having a telephone — it communicates something about our level of seriousness and professionalism regardless of whether or not that is the message that we wants to send. The best option, as always, is to be proactive, and to master the medium. There are many ways to get our message and our brand out, but it is up to us to use them to our benefit. 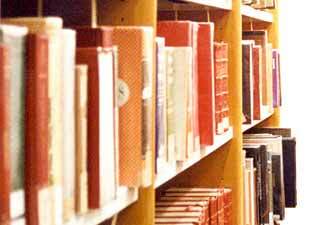 Someone asked me where I find all the time that I do, to undertake all this reading. Well, given that this month’s reading list looks a lot like August’s should say something about how little reading I have done lately! A good friend of mine shared with me that she became a lawyer because that was the last application that was left. While studying for her A-levels as a n 18 year-old , she had no idea what she wanted to do after graduation, and when asked by her Guidance Counsellor what she planned to do, she responded with an honest “I don’t know.” Her Guidance Counsellor, who could not allow this particular vacuum of intent to go undisturbed, insisted that she needed to apply somewhere, especially given how bright she was. They talked over a few ideas, and came up with one, but she had completely run out of applications to the local university for that faculty. However, she did have some remaining applications to the Faculty of Law and… well today my friend is a lawyer. Or to put it more accurately, a she is lawyer who has no passion for the practice of the law. What she does have is a secure job in a secure profession that most people would envy. According to the logic of most Caribbean employees, that is more than enough, and “she should be happy.” After all, what more could she want? While our system of education has tragedy written into its script, with a 16 year old having to choose four subjects on which to “concentrate” to the exclusion of others, there is a wider travesty occurring daily in our societies. People are not working on what they care about. Or, in other words, people find themselves in professions and jobs for which they have no personal passion or belief. They arrive at work each day, go through the necessary motions and come home in the evenings to demonstrate to their children that one must make do with what one has, and never seek to change anything. If anything, most of one’s effort should be directed towards holding on to what one has. I will not argue with whether or not this approach to work is right or wrong, but I do know that it has inescapable consequences. First, it enforces an ongoing mismatch between people and work. If I am too afraid to leave the job I dislike for one I do, then someone else’s interest in this job will never be satisfied. In effect I am blocking them from having it by staying it in myself. Movement from one job to another is a positive thing to be encouraged, in part because brings everyone closer to the work that most satisfies them. Ultimately, this is good for the economy of countries, as productivity has everything to do with job satisfaction, according to Caribbean studies like Why Workers Won’t Work by Kenneth Carter. High quality work is produced most easily by motivated people who want to be in the jobs they have. Second, it creates organizations of people who are demotivated. The faces of people in our service industry across the region who appear to be suffering are encountered everywhere. They seem to have no interest in what they are doing, and no hope that this job will lead to anything or anyplace new. They seem to be just holding out until it all ends… somdeay. Thirdly, the next generation of workers (our young people) comes to identify work with drudgery, as opposed to self-fulfillment. Given the lack of psychic rewards they become unwilling to delay the gratification they can get from both entry-level jobs (with an instant paycheck) and criminal activity. There is no bright future in their minds to look forward to in the long-term, and life instead becomes about getting theirs now. What does this all have to do with networking? To put it simply, networking occurs most easily and naturally when it is a natural extension of what we love to do. Whereas it is possible to do “logical” networking — doing the things that one is supposed to do — it is much easier to do “passionate” networking, starting with topics and questions that one already has an interest in pursuing. And this is where networking begins — with an honest assessment of who we are, what we are interested in, and how to make these real or apparent in the listening of others. The best place to start is withareas of authentic interest. My advice to someone who is not already passionate about what they do is: find something quickly, or resign yourself to a struggle. Who we are will not be denied, not matter how hard we try.